The ridge where the posse was positioned. The canyon where the Smith Gang was positioned. 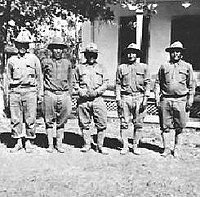 From left to right, First Sergeant Chicken, Jesse Palmer, Tea Square, Sergeant Big Chow, and Corporal C. F. Josh at Fort Apache in 1919. ^ Hunsaker, Gordon A. (2010). Gunfights and Gunfighters: Reflections from a Phoenix Police Officer. iUniverse. ISBN 1-4502-0720-0. ^ a b c d e f g h i j "The Battleground Shootout—Arizona Rangers Fight Smith Gang" (PDF). asoac.org. Archived from the original (PDF) on 2012-03-20. Retrieved June 26, 2012. This page was last edited on 3 November 2018, at 15:37 (UTC).